Founded in 1991, Rosa & Canela B&B is composed of 12 comfortable bedrooms with en suite bathrooms scattered in a beautiful green area. The rooms and bungalows accommodate from 2 to 6 persons and offer TV, mini-fridge, air conditioning, safe, and a verandah with hammock. 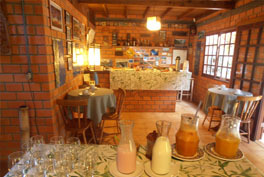 The B&B offers a delicious breakfast with different kinds of bread, including homemade breads, cakes, natural fruit juices, fruits, ham, cheese, homemade jams, yoghurt etc. 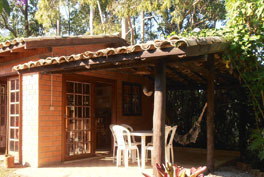 Founded in 1991, Rosa & Canela B&B is composed of 12 comfortable rooms and bungalows very well decorated and cozy. The B&B offers an alternative kitchen with a barbecue place for guests’ exclusive use, parking, bar, lounge and free wi-fi access. 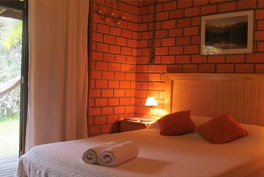 The B&B is located in the central part of Praia do Rosa, between the South and the North beaches. 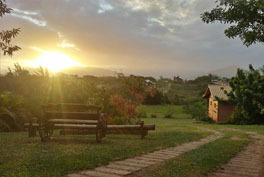 It offers a beautiful view of the sunset behind the “Serra do Tabuleiro” mountains.